During the mid-19th Century, the heaviest cannons used by the U.S. Army were generally designated as seacoast artillery. This classification had its origins in the simple fact that — unlike lighter horse-drawn field artillery, or even medium-sized siege or garrison artillery, which were usually hauled by draft-horses or oxen — the heaviest seacoast class consisted of such ponderous, long-range pieces that they could only be transported overland while suspended beneath a large-wheeled sling cart, and then precariously hoisted atop specially-built barbette-carriages with the aid of a gin and gangs of workers. Seacoast guns were in fact so big, that they had to be aimed from a rotating chassis, anchored on a fixed pintle. Normally, such permanent emplacements could only be made in coastal fortifications or batteries, so as to dominate a broad expanse of adjoining water or shoreline terrain. 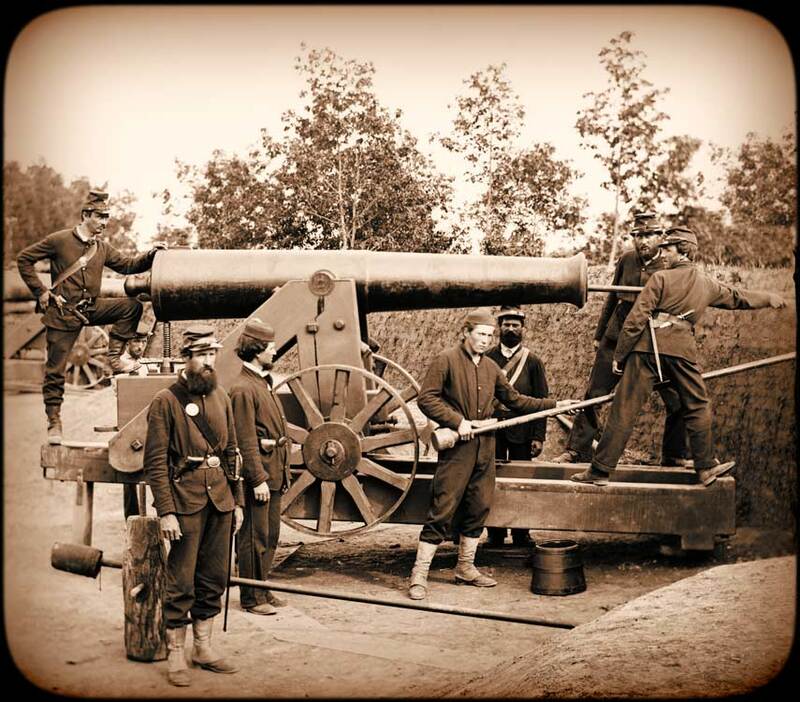 At the beginning of the 19th Century, 24-pounders had been the most common heavy-caliber guns in use by both the U.S. Army and Navy, these pieces being acquired rather indiscriminately from a variety of domestic or foreign sources. Because complications ensued from this diversity of manufactures during the War of 1812, though, a standardized version had finally been designed and adopted by the U.S. War Department under the designation of the “Model of 1819” or M.1819. It called for all future production, starting as of that following year, to be of weapons which measured 124 inches in overall length, featuring a flattened breech; a 57-inch single reinforce which extended for five inches past its trunnions; and a chase that belled out into a flared muzzle-swell. The bore-diameter for all these iron 24-pounders was established at exactly 5.82 inches, and they were to weigh roughly 5,800 pounds apiece. Make your mouse pads custom from zazzle.com. At least 1,125 of these M.1819 24-pounders were delivered to the U.S. Army over the next twenty years, contracted from four different American foundries. Then in 1839, this version was itself redesigned, resulting after a few years of experimentation in a slightly different gun which featured a thicker, more rounded breech-base; a protruding lock-piece on top for its vent; a reinforce divided into first and second segments; a chase-band; and a less-acute muzzle-swell. These new guns would come to be rather confusingly known as either the “Model 1839” or “Model 1845” (the former being the year when this redesign was ordered, the latter when altered production-pieces actually began reaching U.S. 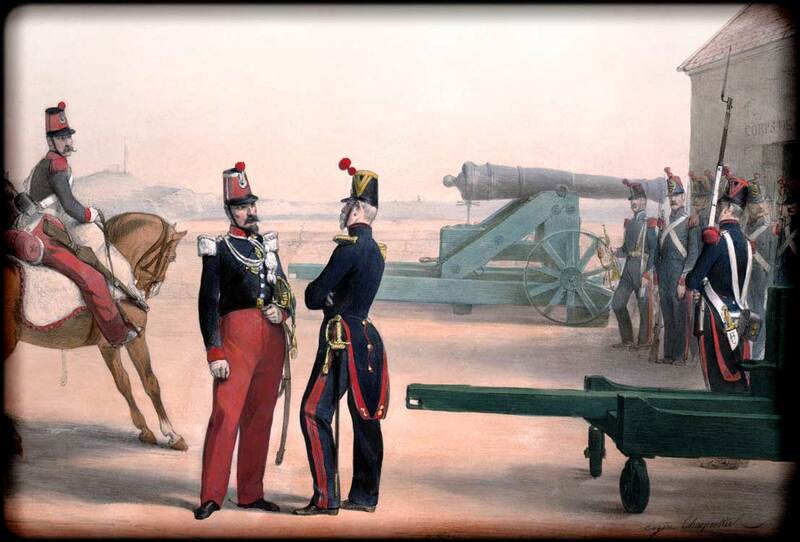 Artillery garrisons), and only 70 or so were ever purchased, as ever-larger calibers were by then being developed and proving to be preferable due to their heftier weight of shot and range. By 1860, American seacoast guns consisted (in descending order of strength) of 10-inch Columbiads; 8-inch Columbiads; 42-pounders; and 32-pounders. Technically, 24-pounders were no longer considered as seacoast guns, but rather had been demoted into the next-lighter category: the medium-size pieces known as garrison or siege artillery. However, since Moultrie only featured ten new 8-inch Columbiads and fourteen 32-pounders among its allotted arsenal, sixteen of its older-generation 24-pounders were still retained in service and counted among its main armament. 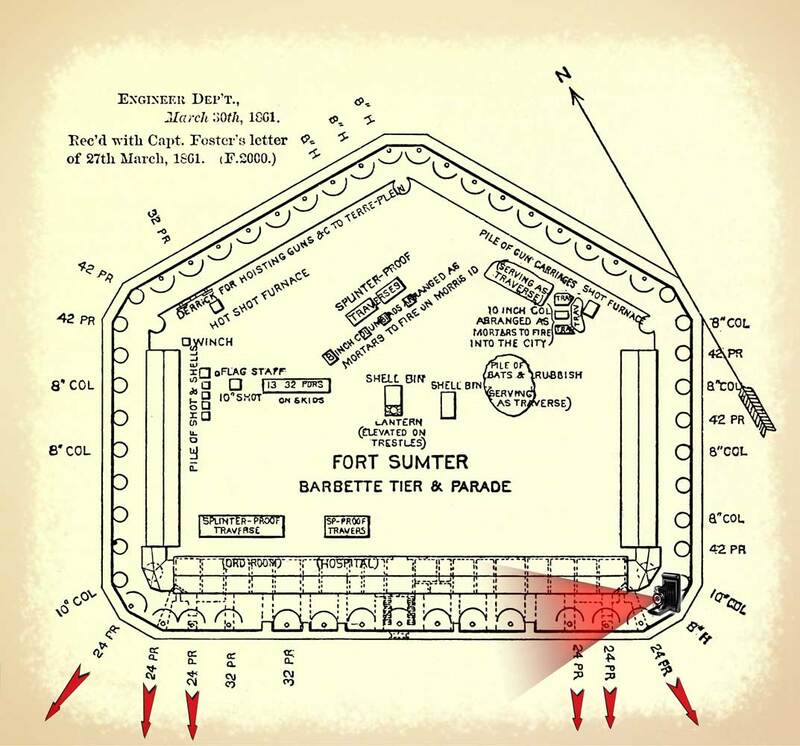 Almost all of Moultrie’s 24-pounders, however, were pointed inland along its secondary fronts, not emplaced along any of its primary sea-channel batteries, whose parapets were reserved for the more powerful and longer-ranged Columbiads and 32-pounders. According to the 1851 U.S. 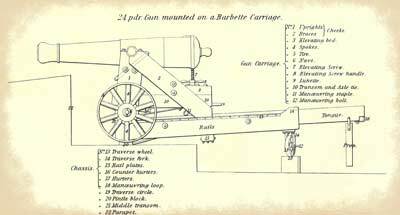 Artillery manual, the tube or barrel of a standard smoothbore, iron cannon designed to fire 24-pound shots measured 10 feet, four inches in length and weighed almost 5,800 pounds. It still featured a bore that was 5.82 inches in diameter, designed to fire a round which ideally was perfectly spherical and had a diameter of 5.68 inches. Solid iron-shot in this caliber actually weighed slightly more than 24 pounds — 24.4 pounds, to be precise — while hollow shells only weighed 17 pounds, not including the additional pound of powder which would have to be poured through its one-inch-wide fuse hole so as to make up its explosive charge. In order to be operated, a 24-pounder would first have to be seated on a carriage and both then evenly balanced atop a barbette-chassis made of thick wooden beams, this whole towering structure resting upon a firm, level surface known as its platform. 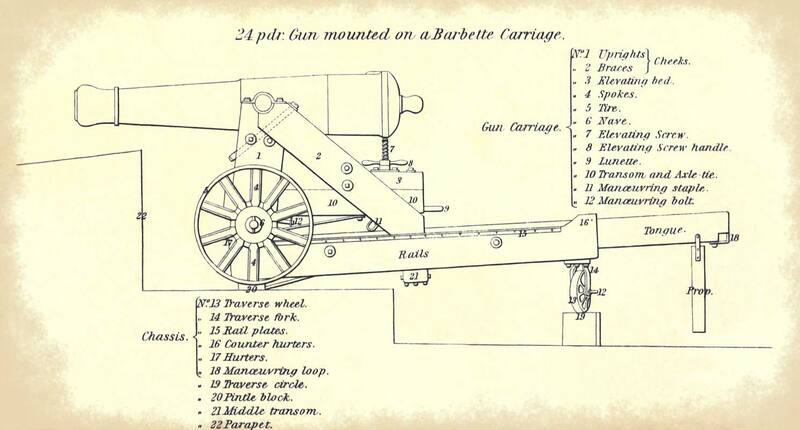 Barbette-carriages for such cannons stood slightly more than six feet high; measured fifteen feet, four inches in length; and weighed almost a ton by themselves. They could be rotated (with considerable effort) on a set of wheels at the rear of their chassis, which rolled over an embedded, semi-circular metal track known as a traverse circle. 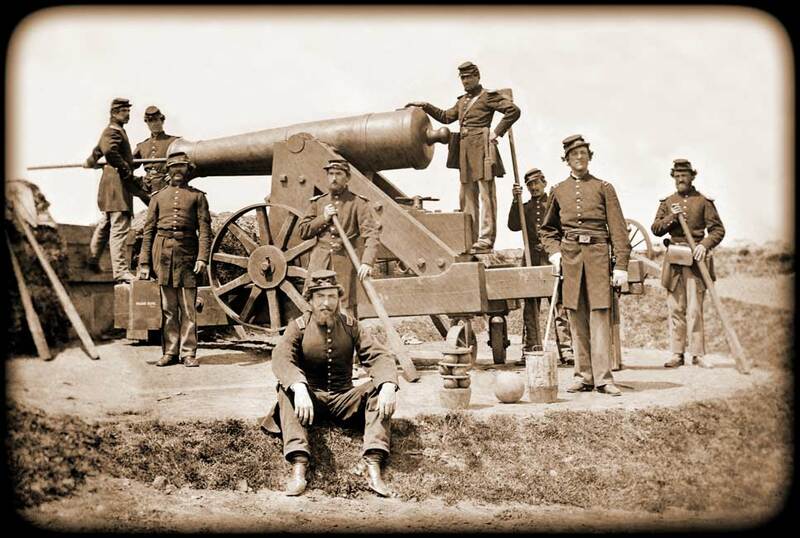 A detachment of four artillerymen and a non-commissioned officer, usually a sergeant or corporal, were required to work and fire a 24-pounder, the same as for most heavy U.S. Artillery pieces of that era. The privates were officially designated as cannoneers, and the non-com in charge of this crew as the gunner or chief of piece, although all were often collectively referred to as “gunners”. Two pairs of cannoneer privates would be stationed along either side of the weapon, with the sergeant or non-com — the chief of the piece — to its left rear, so as to coordinate and direct their movements, in addition to his own gunnery duties. Long implements such as handspikes, and the even lengthier sponge and rammer, would initially be leaned against the parapet on the right side of the weapon. Rounds were piled near the banquette to the left of each cannon, against the parapet, with wads resting atop these stacked balls. Fuses and sighting-instruments would be found suspended in leather pouches from the knob of the gun’s cascabel, out of harm’s way, yet readily accessible at the first word of command. At the command “Take implements,” the chief of piece would clamber up onto the central tongue of the chassis and remove the gun’s vent-cover or apron, distribute the dangling pouches, and level the barrel. The cannoneers would meanwhile seize their handspikes and bars, and assume their positions so as to begin pushing the weapon back from its at-rest “in battery” position against the parapet, to be loaded. At the command “From battery, heave,” each pair of cannoneers would insert iron bars into specially-bored holes on either side of the wheels, and slowly lever the gun backwards, up the 3° barbette-chassis incline away from the breast-height wall. When the muzzle had retreated about a yard past the parapet’s top edge, an order would be given to “Halt,” and chocks would be quickly wedged on the rails in front of the rollers, so as to hold the piece in place. 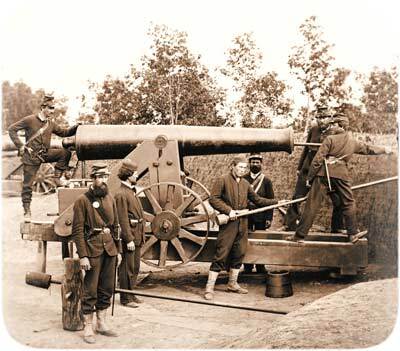 Five-man Union gun-crew posing with a 24-pounder in 1862: the cannoneer at far left is straddling between the parapet and the gun’s barbette-chassis, holding the sponge-handle, which has already been thrust part-way down the barrel. 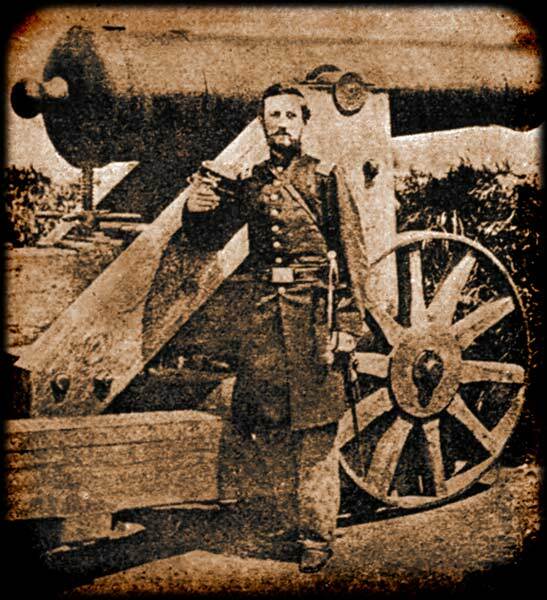 The next cannoneer is cradling a hollow explosive-shell, its fuse-hole pointed toward the camera. The next two cannoneers — a tough-looking pair with pistols thrust into their belts — are holding handspikes of slightly different lengths, with a grapeshot and canister-shell placed on the ground in front of them. The youthful chief of piece is standing atop the chassis’ tongue, his right hand resting over the 24-pounder’s vent-hole. And the officer can be seen at far right, in dress-uniform and with his sword drawn for the occasion of the cameraman’s visit. 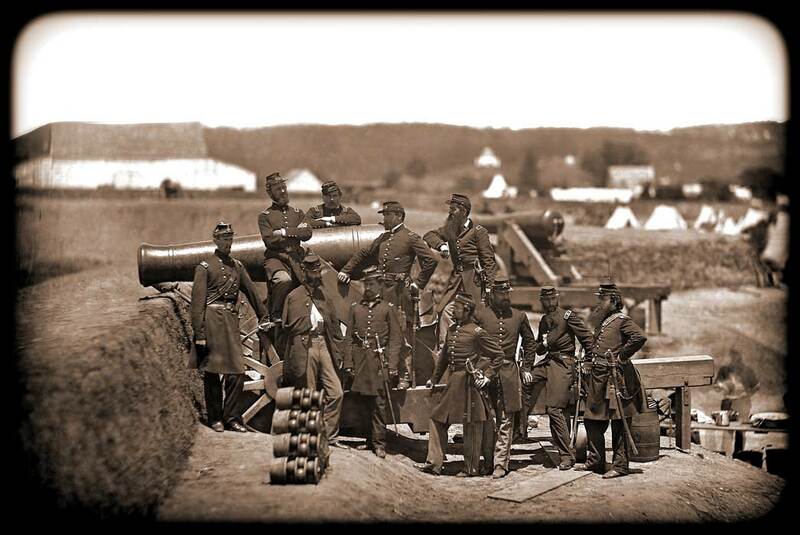 These members of the 4th New York Heavy Artillery Regiment were photographed in the earthen field-fortification known as Fort Corcoran, a Federal stronghold built early during the war in Arlington, Virginia, so as to help defend the approaches to Washington, D. C.
At the command “Load,” the two forward-most cannoneers would insert the long-handled, tight-fitting sponge into the 24-pounder’s muzzle and together twist the sponge around several times so as to clean the bore, while a third ran with a pass-box to fetch live cartridges from the nearby service-magazine. The chief of piece would in the meantime be cranking the gun-barrel upward with its elevating screw, so as to make it easier to subsequently roll a round down its length. When the sponge was withdrawn, a five-inch-wide cartridge would be handed up to one cannoneer and introduced “into the bore bottom foremost, seams to the sides,” so as to be pushed home by his companion with the rammer. A ball then followed (sometimes a ball and wad together), to be likewise rammed home. The chief of piece thereupon pierced the canvas cartridge-bag wedged at the back of the bore, through the vent-hole with a sharp tool known as a vent-punch, so as to expose a few of its powder grains. Then, leaving a priming-wire inserted, he cranked the gun-barrel back down to its desired elevation. 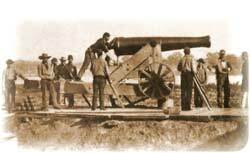 All four cannoneers would then remove the chocks from the rollers, and use their iron bars and handspikes to lever the piece back down the chassis toward the parapet, halting it in a position to be fired. Final adjustments so as to fine-tune the aim could be made by using the handspikes to traverse the chassis slightly to left or right, while the chief of piece peered along the sight-line and turned the elevation-screw, before finally removing the priming-wire. Immediately after the deafening discharge of the cannon, two of its gunners would reinsert the chocks onto the rails, so as to halt the gun in its recoiled position. The whole procedure of sponging out its barrel, and ramming home a fresh cartridge, ball, and wad would then be repeated, and continued until an order was eventually given to desist and stand down. The normal rate of fire for such a ponderous weapon was several minutes between each shot, batteries firing their individual pieces every ten or fifteen minutes if a continuous bombardment was required, so as to avoid confusion in observing and relaying information as to the accuracy of each round. Once the threat of action had ceased altogether, the piece would be secured, and its implements safely stored away. 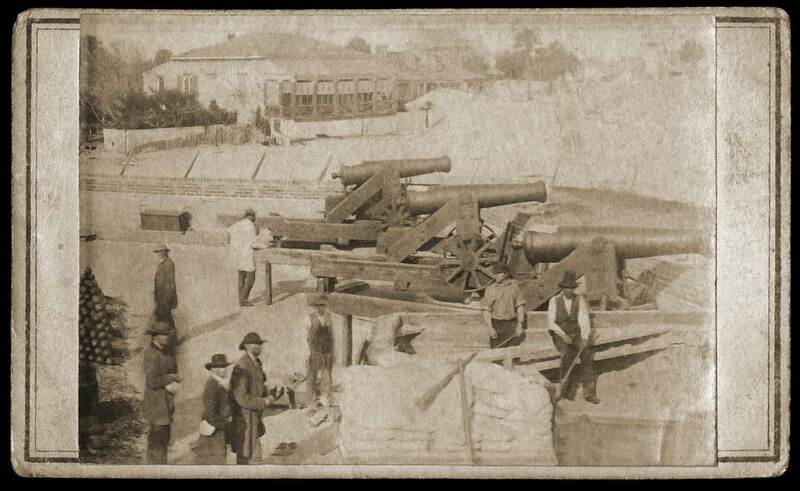 Five-man Confederate gun-crew with their M.1819 24-pounder, in the busy water-battery at Warrington in Pensacola Bay, February 1861: two cannoneers can be seen at left, swabbing out their piece’s bore with the sponge together, as called for in regulations. The officer in his dark Hardee hat and blue uniform-coat, can barely be discerned posing beside the carriage wheel. Immediately behind him, a third cannoneer rests a cannonball atop its wheel-rim, while a fourth cannoneer in a white shirt holds the extended lanyard, as if ready to fire — although the lanyard would have normally been pulled from the far side of the chassis. The chief of piece, armed with a long, cumbersome sword and loud checkered shirt, leans on the 24-pounder’s cascabel as if about to sight at a target. Note the hot-shot furnace in the distance behind him. Photograph taken by J.D. Edwards of New Orleans, and today housed in the National Archives and Records collections. Because of their longer range and heavier weight of shot, the latest-model guns had been mostly concentrated along Moultrie’s primary south face, so as to command the two channels which funneled into Charleston Harbor. 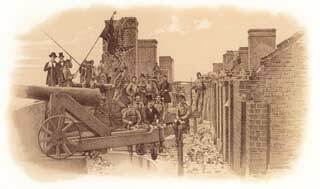 The most recent arrivals, for example — the Columbiads, having been received and installed by late 1859 — were mounted in specially-cut recesses at the strategic corners or “shoulder angles” at the fort’s Southeast and Southwest Angles. Although a half-dozen of its best 24-pounders had also been retained along the outer extremities of its Main-Channel Battery, most had been relegated by 1860 to lesser sectors and thus were merely lining Moultrie’s landward-facing parapets, where no real military threat was ever anticipated. Such guns seldom received much attention from the under-strength peacetime garrison, whose exercises were largely confined to a select few heavier pieces. Create own mousepad on zazzle. For this reason, the seven idle 24-pounders resting along Moultrie’s western face — occupying Gun Positions 4 through 11 — were pointed directly across the street at the windows of Colonel Gardner’s private off-base house, which sat amidst other equally well-to-do residential homes in neighboring Moultrieville. Three more 24-pounders were likewise mounted along the fort’s north face, aimed at its storerooms and other auxiliary buildings, which stood only a couple of hundred yards away in Moultrie’s adjoining open-air U.S. Army compound, known as the Reservation. 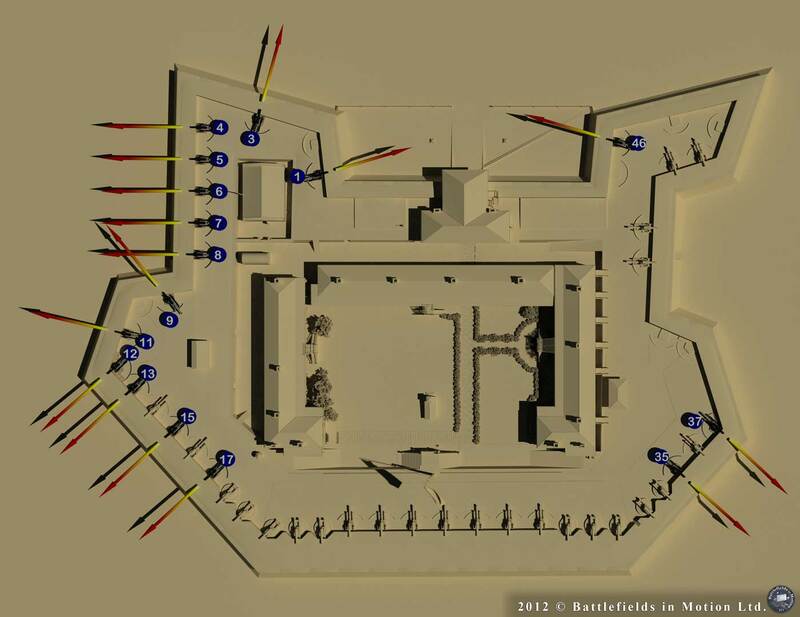 Although the exact positioning of each individual piece around Moultrie’s parapets was never definitively recorded on any official chart or diagram, examination of contemporary photographs affords at least some general idea as to their pre-war distribution. By early April 1864, only two of Moultrie’s sixteen 24-pounder smoothbore guns would still remain emplaced around its ramparts, both pointing toward the rear from its Northwest demi-bastion. 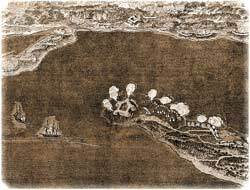 Smaller Castle Pinckney, situated even deeper inside Charleston Harbor, featured a further four 42-pounders and fourteen 24-pounders among its antebellum armament, not all of which were fully functional, either. When Moultrie’s Federal garrison had quietly abandoned that small and vulnerable outpost on Sullivan’s Island, in order to steal across the harbor mouth and occupy the much more impregnable but incomplete Fort Sumter on the night of December 26-27, 1860, they arrived to find this major stronghold’s heavy ordnance largely uninstalled. 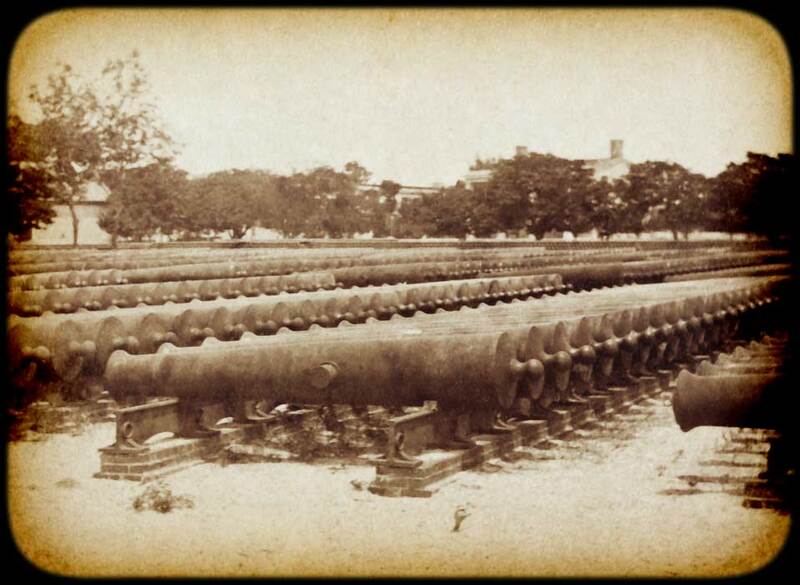 According to a report which had been filed only a month-and-a-half previously, after an inspection made of Sumter’s ongoing construction-efforts on November 6, 1860 by the Assistant Adjutant-General, Maj. Fitz John Porter, its armament deliveries had thus far consisted of 78 seacoast guns — ranging from big 10-inch Columbiads down to a half-dozen 24-pounders and a few lesser field-pieces, along with all of this assorted weaponry’s requisite carriages and implements, plus abundant ammunition and 39,400 pounds (almost twenty tons) of gunpowder. In light of the angry reaction which had subsequently erupted from South Carolina’s authorities against his garrison’s unexpected relocation, Maj. Robert Anderson directed his subordinate engineer, Capt. 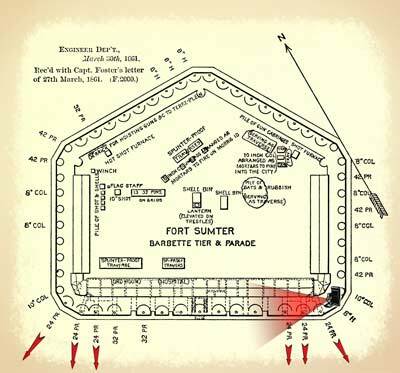 John G. Foster, to quickly make Sumter as defensible as possible, by securing every access-point and mounting its ordnance in their appropriate embrasures. 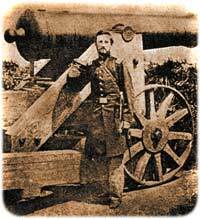 With only 64 U.S. artillerymen and the 55 hired workers initially at his disposal, Foster managed to install almost all of the fort’s heavy pieces over the next three months (except for thirteen 32-pounders, which remained lying on their skids in its inner courtyard). Sumter had originally been planned as part of a powerful new generation of U.S. coastal strongholds, so had been allotted an up-to-date arsenal consisting mostly of the largest-caliber and longest-range weaponry available, with which to sweep the harbor entrance and its adjacent shorelines. See another iPad sleeve design. Consequently, its six 24-pounders — among the lightest pieces in Sumter’s inventory — had therefore been consigned by Foster to occupy the rear pan-coupe angles of its uppermost barbette-tier, in order to cover the closest marshy approaches through the shallows from James Island near its gorge or sally-port gate. And even this weak secondary-battery, with no double-tier of casement gun-positions below it on the fort’s lower two levels, was further broken up by five broad brick-chimneys which extruded from its parapet. 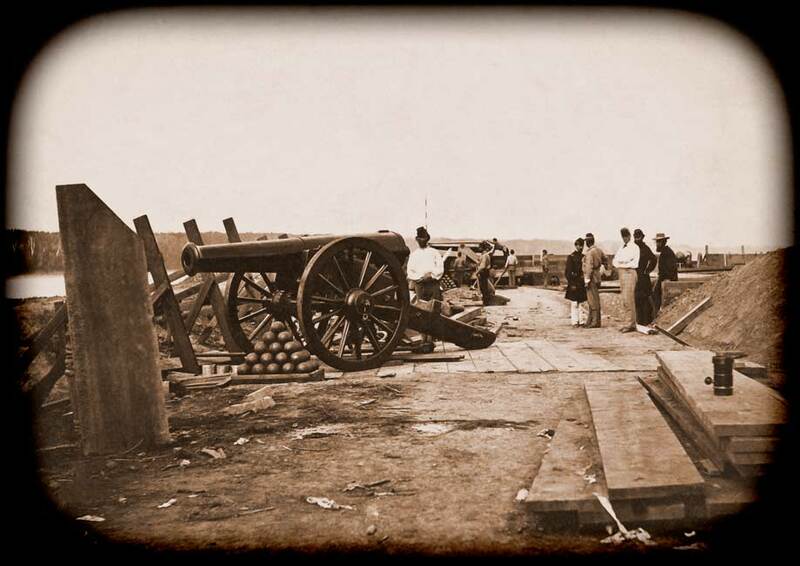 When the encircling Confederate artillery at last opened fire at dawn on April 12, 1861, these exposed 24-pounders would not even be manned by Sumter’s under-strength Federal garrison, who preferred to reply with their heavier ordnance from within the enclosed casements of its lower tier. Foster nevertheless noted in his official journal how: “A part of the [Confederate] guns from Cummings Point essayed to dismount the barbette tier on the gorge, and the remainder to breach the gorge, or rather the pan-coupe at the right gorge angle.” The effects of this concentrated fire can be plainly seen in the accompanying print, based upon a photograph which shows the smashed chimneys and dislodged masonry-bricks strewn about the terre-plein at this particular spot. It is possible that the soldiers posing triumphantly atop these 24-pounder barbette-carriages on April 15, 1861 — two days after the surrender of Sumter — were the same members of the Palmetto Guard who had fired these damaging rounds from the “Iron Battery” at Cummings Point, and since been reassigned to garrison the captured fort itself. Although blurry, this rare old photograph affords a glimpse of what appears to be a pair of Confederate 24-pounder guns, mounted on siege carriages and emplaced behind a low seaside epaulement or field-work, before the Civil War had even begun. South Carolina having seceded from the Union as early as December 20, 1860, this state’s peacetime militia companies had been mobilized and were subsequently deployed to prevent any Federal relief-force from reaching the U.S. Army garrison ensconced within Fort Sumter, inside Charleston Harbor. As part of this defensive build-up, the city’s Washington Light Infantry had been ordered to “Thompson’s Point” at the far eastern end of Sullivan’s Island on March 17, 1861, this unit’s commander Capt. Charles H. Simonton being instructed to erect a battery and shoreline fortifications there, so as to cover the mouth of Breach Inlet and deny entry to a Federal seaborne expedition which was believed to be preparing to bring in a large number of relief-troops. Two Confederate 24-pounders emplaced amid the sand dunes, in late March or early April 1861. 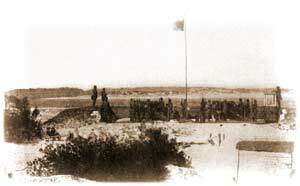 A detachment of Washington Light Infantry, numbering 90 men, under command of Captain Simonton, have charge of the battery at the entrance to Bull’s Bay. Their camp is called Camp Washington. In fact, other reports suggested that both companies of the Washington Light Infantry — totaling roughly 170 men — were present at this station, and it is well documented that their heavy pieces were actually covering the entrance into Breach Inlet between Sullivan’s Island and Long Island [modern Isle of Palms], rather than Bull’s Bay, which lies more than twenty miles farther up the coast. 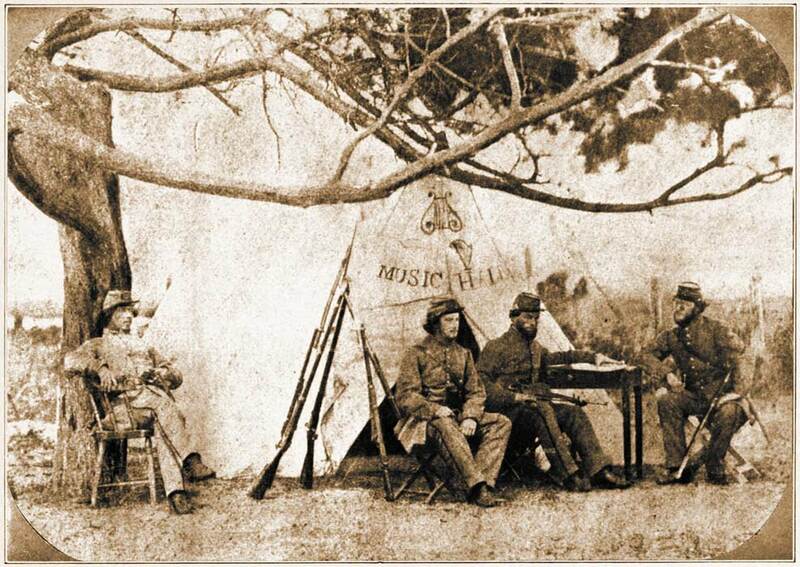 These young volunteer militiamen were to play no part during the subsequent bombardment of Fort Sumter on April 12-13, 1861, except as distant spectators. Indeed, their chaplain Anthony T. Porter would write many years later in his memoirs how members of this unit had even wandered a couple of miles away from their assigned, yet uninvolved position — as far as the Moultrie House Hotel — so as to view the exciting cross-harbor exchanges of artillery fire from that building’s observatory, until they were sent scurrying back out by several well-placed rounds from Sumter. Eight days afterward, the Washington Light Infantry was rotated off of Sullivan’s Island altogether, back into Charleston. Spurred by the earliest outbursts of secessionist fervor which were being aroused in Florida, the young First Lt. Adam J. Slemmer — acting commandant of the large U.S. Army installation at Pensacola — had withdrawn its tiny peacetime garrison of 81 Federal officers and men on the morning of January 10, 1861, into the relative safety of Fort Pickens on Santa Rosa Island. This isolated offshore stronghold commanded the harbor entrance, was difficult to threaten because it lay beyond range of most heavy artillery-pieces (except for 10-inch seacoast mortars), and could be reinforced by sea. Two days later, several hundred Southern militiamen appeared out of the interior under Col. Tennant Lomax of Alabama, to seize the Navy Yard and all other remaining Federal installations on Pensacola’s mainland without opposition. 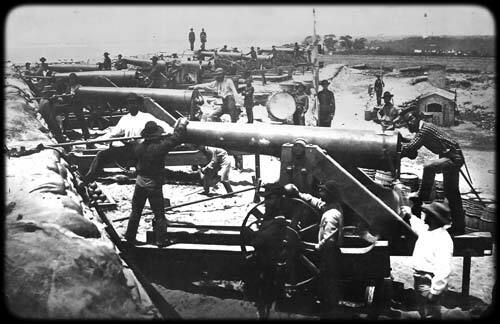 125 heavy “sea-coast and garrison cannon” within kidney-shaped Fort McRee, among them three 10-inch and twelve 8-inch Columbiads; twenty 42-pounder guns; twenty-four 32-pounders; sixty-four 24-pounders; etc. 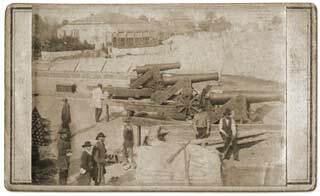 plus another 44 guns either mounted or in storage at Fort Barrancas, including thirteen more 8-inch Columbiads and howitzers; two 10-inch seacoast mortars; eleven 32-pounders; ten 24-pounders; plus assorted older pieces and field-guns. 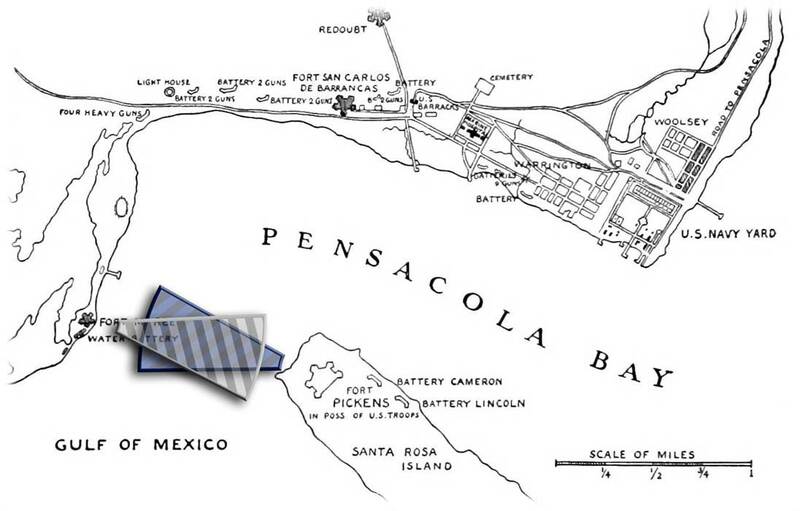 Shortly after having occupied the U.S. military and naval facilities ashore, local militia commanders — given the large numbers of volunteers still pressing in to join their ranks at Pensacola — had begun issuing orders to employ these men in clearing and manning the long-idle batteries in the various mainland forts. 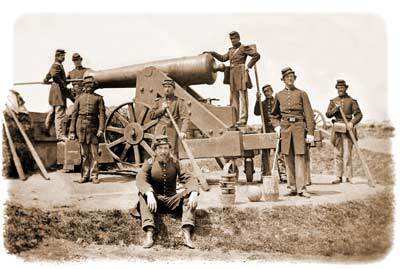 But the lack of professional artillerymen among these militia volunteers had rendered most of their early labors ineffectual. For example, the disgraced ex-U.S. Army cavalry Capt. Theodore O’Hara — at the head of the undisciplined “South Alabama Rangers” — had initially assumed command over strategic Fort McRee, which was located on Perdido Key directly opposite the outnumbered Federal contingent ensconced across the harbor-mouth within Fort Pickens. O’Hara had set about unspiking and remounting McRee’s guns, as well as extracting others from storage and commencing to lay out an adjacent “water battery” to receive some of these additional pieces, until he was brusquely dismissed when the newly-commissioned Confederate Brig. Gen. Braxton Bragg arrived to assume overall command of operations at Pensacola as of March 11, 1861. Bragg had reportedly found things in such a “deplorable condition” around Fort McRee, that he would deride O’Hara in his official correspondence to the Confederate capital of Montgomery as a “drunken loafer from Mobile,” whose regiment was so inept that “it took a week’s drunk” to simply get it organized. A former West Point-trained U.S. Artillery officer who had distinguished himself during the Mexican-American War, Bragg greatly tightened the discipline among the motley assortment of volunteer units — whose numbers soared within a month from 1,100 to more than 5,000 men — and saw to it that all the forts now under Confederate control were properly garrisoned, as well as directing the installation of new, well-sited and correctly-constructed batteries around the sandy shoreline. The effects of Bragg’s leadership can be perceived in the two accompanying photographs, both of which were taken at Fort McRee by the visiting J. D. Edwards of New Orleans in late April or early May 1861. The first picture here above captures a view looking northward across the parade of this occupied stronghold, shot sometime in early afternoon, judging from the shadow-lines visible at the left-hand side of this image. Note the well-aligned ranks of assembled Confederate militiamen in the foreground, and the neatly-arranged surplus guns on skids behind them (including a half-dozen 24-pounders), as well as the stacks of shells and other materiel prepared beside the two hot-shot furnaces. 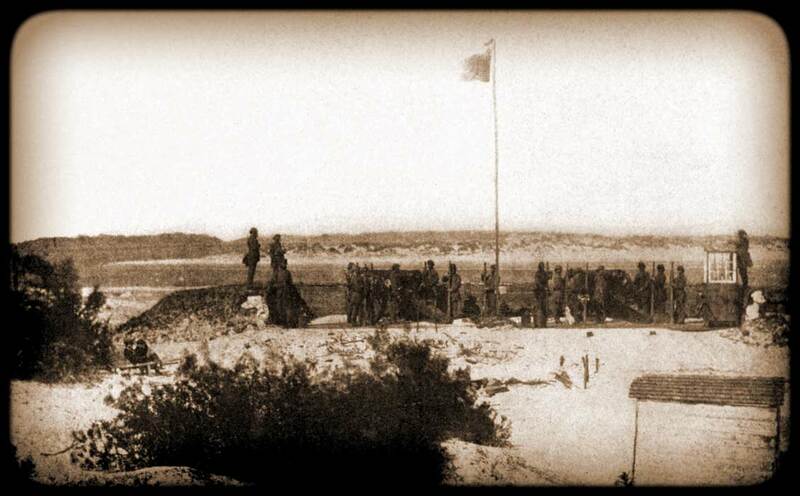 The second photograph at right shows an equally well-drilled platoon standing at attention outside of the fort itself, in the sandy open terrain just to the west of McRee on Perdido Key. 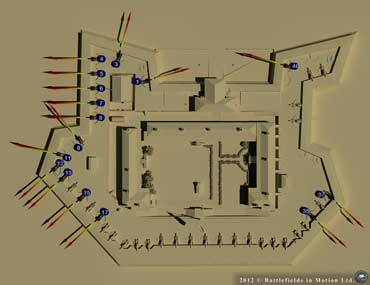 Before this same year was out, the triple-tiered fortification would be virtually destroyed in a major military action. Starting shortly after 10:00 a.m. on the morning of November 22, 1861, McRee was subjected to a concentrated bombardment from the 12-gun, 5,600-ton Federal screw-frigate Niagara and 22-gun, 2,600-ton sloop Richmond, as well as the largest guns and mortars positioned around Fort Pickens. Initially, the Confederate gunners within McRee were able to hold their own and drive off the smaller Richmond, by exploding a shell four feet beneath its starboard counter, which started a leak and compelled this Union sloop to retire toward Key West for repairs. However, the combined pounding left McRee completely silent by 5:00 p.m. that same evening, its garrison commander Col. John B. Villepique informing General Bragg overnight that his position was dangerously exposed, and half of his guns dismounted. 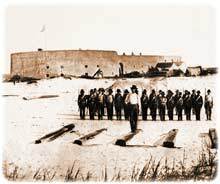 When the Niagara and heavy guns around Fort Pickens resumed their fire at 10:45 a.m. next morning, November 23rd, Fort McRee’s defenders were unable to even respond. The kidney-shaped stronghold was badly damaged in the ensuing one-sided exchange, large chunks of its ramparts being blown away or smashed, and most of its wood decking destroyed by fire. 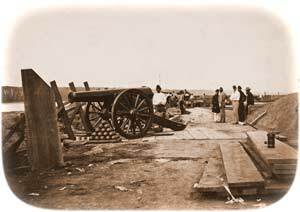 Fort McRee’s guns would not be used again, its gutted shell being set ablaze when Confederate forces abandoned Pensacola altogether in May 1862. Yet amazingly, one of its original 24-pounders has survived until our modern times. A piece which according to its left-hand trunnion dating of “1837” and muzzle-initials of “R.L.B.” for inspector Rufus Lathrup Baker, identifies it as having been cast at the old Fort Pitt Foundry in Pittsburgh, Pennsylvania, on February 15, 1837, weighing in at 5,528 pounds. Since Fort McRee was completed in 1839, it is quite likely that this particular cannon was featured among its initial allotment of heavy ordnance. More recently, it has been in the possession of the private collector John Morris of Springfield, Virginia. Because of the number of older-vintage 24-pounder guns existing in antebellum arsenals throughout the country, these particular weapons were to figure notably among the very first pieces of heavy ordnance deployed into the field once the Civil War erupted. An early example was to be provided at the advance Union base of Cairo, a river-port hastily being fortified as a marshaling-point at the southernmost tip of Illinois, with the name of “Camp Defiance”. On April 19, 1861 — less than a week after Sumter’s surrender — the new U.S. Secretary of War Simon Cameron had telegraphed an order from Washington, D.C., to the recently-inaugurated Republican Governor of Illinois, Richard Yates, directing him to garrison Cairo — a small city of some 2,200 residents, which had now assumed considerable strategic importance because of its location at the crucial junction of the Ohio and Mississippi Rivers. Yates promptly issued the necessary instructions so that on April 22, 1861, a force of 600 volunteers from Chicago under the command of militia Gen. Richard Swift reached that river-port by rail, ensconcing themselves with four small 6-pounder field-pieces. A couple of days afterward, the Mexican War veteran Benjamin F. Prentiss assumed overall command at this base, being elected as Brigadier of its militia volunteers and directing the rapid assemblage of a sizeable Union army. 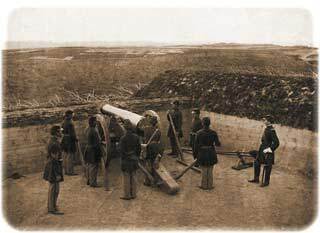 Within less than two weeks, a correspondent was writing to the New York Times on May 3, 1861, to report that almost 6,000 troops had already gathered, “all new levies, partially uniformed and tolerably well armed, except that they are very deficient in cannon.” As more and more regiments continued to appear at Camp Defiance, no heavy ordnance was as yet received. View more iPad accessories at zazzle.com. 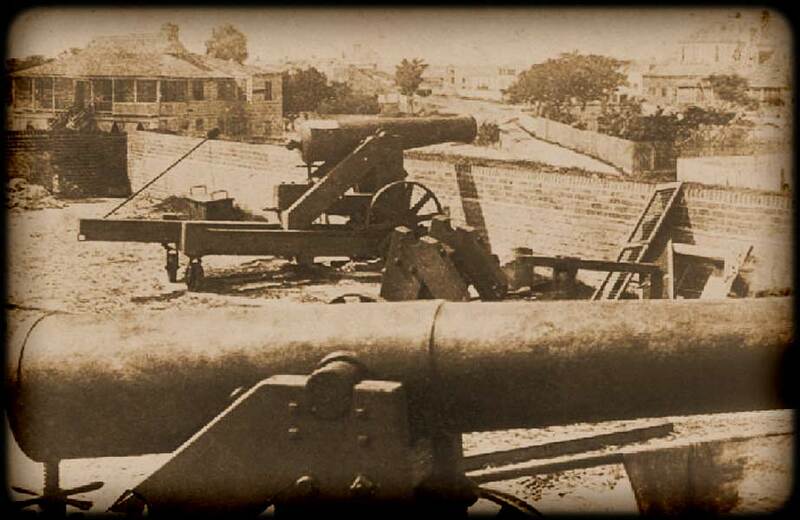 Finally, some railway flatcars reached Cairo on May 28, 1861, bearing three 32-pounder guns, three 24-pounders, a howitzer, and an 8-inch siege mortar, complete with their respective carriages, barbette chassis, ammunition, accoutrements, etc. 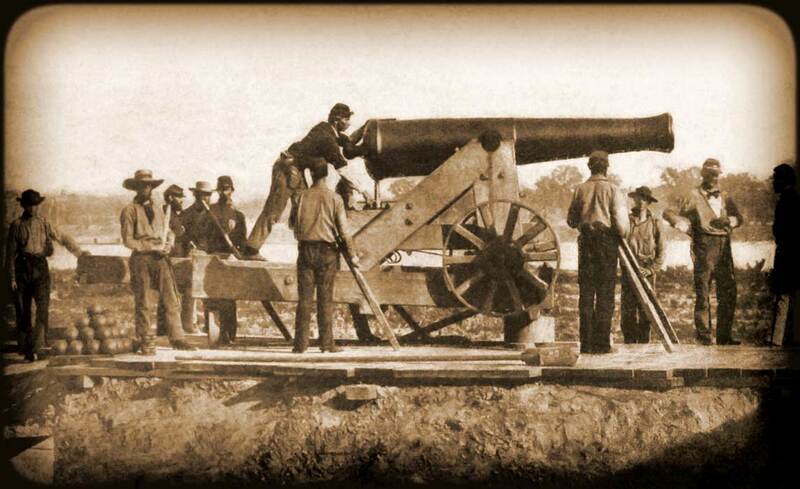 The arrival of this heavy ordnance sparked cheers throughout the sprawling Union camps, and hundreds of soldiers toiled throughout the next couple of days in tearing down the old distillery at the peninsula’s southernmost tip, so that its flat mound of earth might be leveled and enclosed within earthen fortifications to install this artillery. Eyewitness drawings of these guns’ arrival and emplacement were sketched by a reporter named Alexander Simplot, to be published on Page 390 of the June 22, 1861 edition of Harper’s Weekly. Once these defenses were complete, “Camp Defiance” would be renamed “Fort Defiance” or “Fort Prentiss”, in honor of its commander. By the end of July 1861, its ordnance had been further augmented with a “64-pounder” (a 32-pounder smoothbore gun re-bored with rifled grooves, so as to more powerfully fire elongated shells) and numerous lesser pieces. 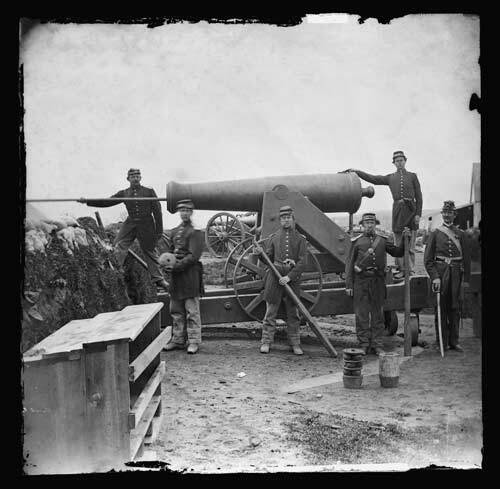 The accompanying pair of matched photographs shows officers of the 69th New York “Fighting Irish” State Militia Regiment, posing atop an M.1845 barbette-mounted 24-pounder gun in Fort Corcoran — a scene most likely staged sometime in early July 1861, shortly after this field-fortification had been completed. Already in existence for more than a decade, the 69th had been amongst the very first Federal regiments hastened to the defense of Washington, D.C., departing New York City aboard the steamer James Adger on the evening of April 23, 1861 — only ten days after the surrender of Fort Sumter. Disembarking at Annapolis, Maryland, on April 26, 1861, the 69th paused to help repair and guard the railway depot at nearby Annapolis Junction, until they were relieved by the 5th New York State Militia on May 3rd. Resuming their interrupted trip, the 69th reached the national capital next day, May 4, 1861, where they encamped for another three weeks on the nearly-empty hilltop campus of Georgetown University. 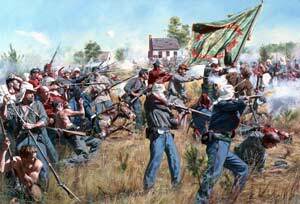 The 69th had also been officially mustered into United States service for a period of three months as of May 9, 1861, and further reinforced by a company of Irish Zouaves which belatedly joined them from New York City on May 23rd. That very next day, the entire regiment was marched across the Potomac River into Virginia to be employed — along with the 5th and 28th New York State Militia Regiments, together constituting the “Aqueduct Brigade” — in constructing earthen fortifications atop Arlington Heights, so as to guard the southern end of the Aqueduct Bridge. The particular stronghold built by the 69th, designed to enclose twelve heavy pieces with a garrison of 180 artillerymen inside its 576-yard enclosure, was initially supposed to be named “Fort Seward” in honor of the Senator from New York and newly-appointed U.S. Secretary of State, William H. Seward. However, the War Department insisted that it be given the name of the 69th’s regimental commander: Col. Michael Corcoran, the officer seen standing at the far left in the two conjoined photographs above. (The officer with his right arm in a sling is believed to have been Corcoran’s second-in-command, Lt.-Col. Robert Nugent, who had been recently injured by a fall from a horse.) It was moreover recorded that when the heavy ordnance had been installed into this fort, the 69th chaplain Father Thomas Mooney had baptized the guns — and been promptly recalled by New York's Bishop, as this act had struck Church elders as impious. 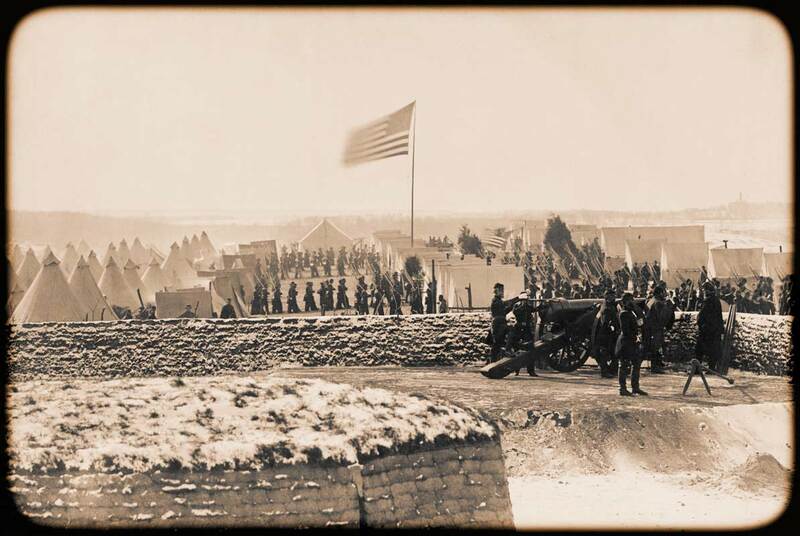 A few days after the above photographs were taken, the 69th Regiment would be marched out of Fort Corcoran on July 16, 1861 to Centreville, Virginia, so as to become incorporated into Irwin McDowell’s 28,500-man army for an offensive against Gen. P.G.T. Beauregard’s Confederate army, awaiting them around Manassas Junction. This advance culminated in a Union defeat five days later at the First Battle of Bull Run, the 69th being badly mauled during this fighting, and Corcoran taken prisoner. Two months afterward, he and 155 other captives would be shipped by rail to Charleston, to be interned in Castle Pinckney. View more laptop computer sleeve. Make your own refrigerator magnets at zazzle.com. Browse other MacBook Air sleeve designs on Zazzle. Talk of stopping a cyclone, it was impossible. The rush of soldiers, Congressmen, and other civilians from Washington, literally forced us from the highway. I saw three officers on one mule, hatless, coatless, and unarmed, and apparently badly frightened; the Johnnies did not follow up with any force. The Fort was dedicated this morning at 9 o’clock [on September 16, 1861], under the order of the Brigadier General [Sherman]. The Regiment turned out in full uniform at the appointed hour and marched inside the Fort, where we formed into line of battle. The staff officers of the division were all present during the ceremony. Rev. Dr. Strong, Chaplain of the Regiment, opened the services with prayer, and made some eloquent remarks suitable to the occasion, after which a splendid American Flag was raised, by a national salute of thirty-four guns, the Band playing “Star Spangled Banner,” “Hail Columbia,” “Red White and Blue,” “Yankee Doodle,” etc. 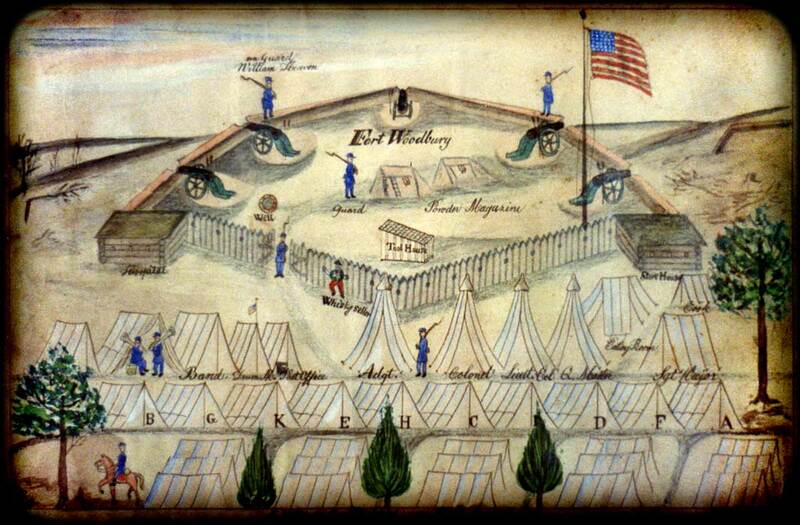 Colonel Woodbury proposed three cheers for the American Flag, which were given with a will. Cheers after cheers rent the air for Gen. McClellan, Gen. Porter, Fort Woodbury, and others. A breastwork from our Fort to “Fort De Kalb” is nearly completed. Fort De Kalb is to our right about one-half mile distance; on our left is Fort Cass and Fort Hoffman, and about half a mile distant from each other. The former was built by the 9th Massachusetts, and the other by the 21st New York Regiment. 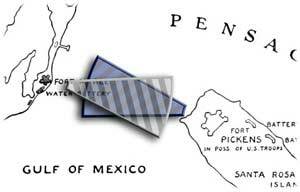 To our rear about a mile is Fort Corcoran, built by the 69th New York Regiment before the Bull Run affair. Gun-crew from the 4th Michigan Regiment, posing atop a barbette-mounted 24-pounder inside Fort Woodbury, September 1861. The Forts are completed. Ours is named “Fort Cass,” in honour of our Colonel [Thomas Cass]; the one built by the 4th Michigan is named “Fort Woodbury,” after their Colonel [Dwight Woodbury]; and the other is called “De Kalb,” after the [41st New York] regiment that built it [rather than the 41st’s actual Colonel, Leopold von Gilsa]. “Fort Corcoran,” the one built by the 69th New York, is a little on our right and rear. Initially, Fort Woodbury’s allotment of heavy artillery consisted of only two barbette-mounted M.1829 24-pounder smoothbore guns; two more 24-pounder smoothbores mounted on siege carriages; and a 24-pound field howitzer, all widely spaced around its 161-yard rampart. Such a small number of pieces required only 75 men (less than a single company) to serve as their gunners, so that Company K of the 4th Michigan — known as the “Dexter Union Guard,” as they had originated from the town of Dexter, Michigan — was apparently detailed to remain in the fort and train as its artillerymen, while the bulk of the regiment made several forays against the distant Confederate lines in late September and early October 1861. The accompanying photograph shows some of these new Company K gunners-in-training at their stations, a few still wearing their infantry gaiters. The two men on either side of the gun’s wheel, furthermore have on brimless “Canada hats” or “Canada caps,” a distinctive tasseled headgear of French origin, unique to Michigan. ... not garrisoned, having an ordnance sergeant and two sentinels. The slopes are caving in. One of the magazines is flooded with water, the ammunition all being stored in the other one. The guns, ammunition, and abatis in good order. 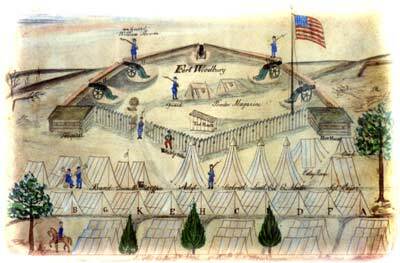 Fort Woodbury had remained under the supervisory care as of February 18,1862 of the 88th Pennsylvania Regiment, which had detached five companies from its provost headquarters at Alexandria to “garrison forts on Maryland side of the Potomac River,” but with the coming of better campaigning-weather in springtime, Companies A and E of the 4th New York Heavy Artillery arrived to actually reoccupy Woodbury by early April 1862. Its original five-gun armament was further augmented with four 6-pound James rifled guns, three 30-pound Parrotts, and a 24-pound Coehorn mortar. Once the Civil War concluded three years later, its earthen ramparts were allowed to disintegrate and disappear back into the landscape, their outline having once stood near where Troy Street North and 14th Street North intersect today in modern Arlington Heights, Virginia. Curiously, a notion had also sprung up over the intervening century-and-a-half, that this fort had been named for Lt.-Col. Daniel P. Woodbury, the U.S. Army engineer who had planned much of the Arlington Line defenses, rather than the true honoree: Col. Dwight Woodbury of the 4th Michigan. The 4th Connecticut Volunteer Infantry Regiment had been raised in and around Hartford during the first few weeks of the war, and was to be officially constituted as of May 21, 1861, for three months’ service under the command of Col. Levi Woodhouse. However, since Pres. Abraham Lincoln had issued a call for three-year voluntary service less than three weeks prior to this date, the 4th Connecticut Infantry was requested — and its members agreed — to be mustered in on that very next day (May 22, 1861), as a “three-year regiment”, certainly the first regiment in Connecticut and possibly the entire Union, to be enrolled for that extended length of service. 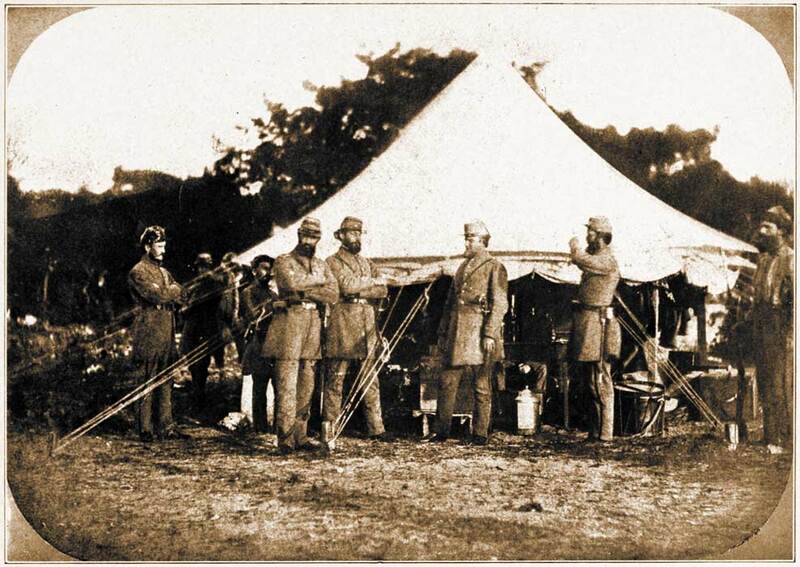 The 4th Connecticut Infantry departed its camp “at Fishfry St.” in Hartford on June 10, 1861, to be shipped out for service in defense of the national capital. Upon arriving in the vicinity of Washington, they were initially assigned to duty at Chambersburg in the “Department of Pennsylvania”, as part of Gen. John J. Abercrombie’s 6th Brigade, 2nd Division. After being moved on to Hagerstown, Maryland, and then to Williamsport, Virginia on July 4, 1861, the 4th Connecticut was briefly attached to the Army of the Potomac at Frederick as of August 16th, before being ordered to Darnestown on September 5, 1861. Finally, the regiment was directed to march and encamp in the field beside newly-completed Fort Richardson on October 9, 1861, which would remain its permanent base for the next six months. 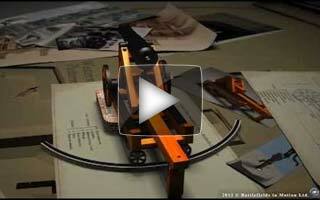 It is small, but well built, well armed, and amply provided with bomb-proofs and magazines. The ravines in front will be seen by the rifle-trenches in construction. A rifled 100-pounder is being placed in this work, which will sweep a sector from Fort Ellsworth to Fort DeKalb. Nine guns, as follows: Two 24-pounder barbette; three 24-pounder siege guns; two 30-pounder Parrotts; and two 10-inch siege mortars. One of the mortars is unserviceable from its trunnions being too large for the bed. One magazine leaks slightly. In other respects, fort in good condition as to guns, ammunition, parapets, and abatis. 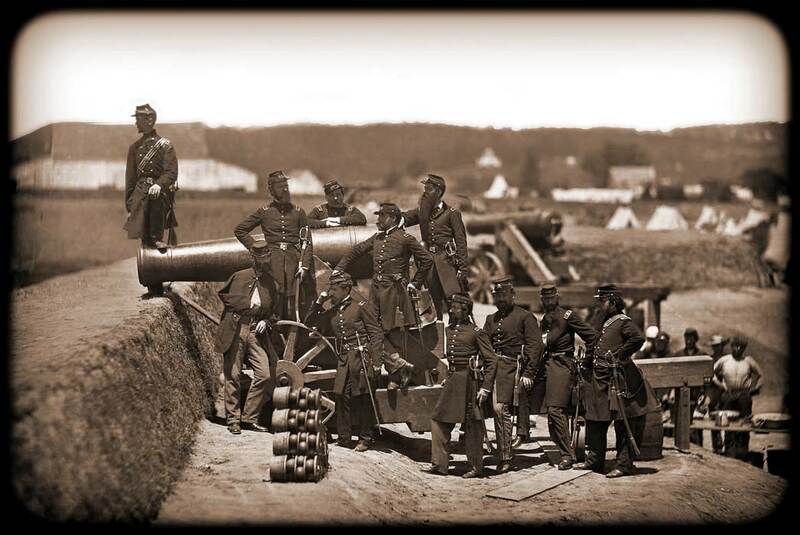 On a damp day, most likely sometime during December 1861, gun-crews from the 4th Connecticut Infantry Regiment can be seen posing at their pieces inside Fort Richardson, under the watchful eyes of their commander Col. Robert O. Tyler. Most of the small fort’s artillery are encompassed within this view, taken from atop Richardson’s western parapet: two of its three smoothbore, iron 24-pounders can be seen mounted on siege-carriages (the third being just out of sight at lower left); two more of these same elderly smoothbore 24-pounders, although this pair mounted on barbette-carriages; and two new, more powerful and accurate 30-pounder Parrott rifles, emplaced strategically in the corner-angles of this earthen field-fortification. The men are in dress uniforms for this special occasion of a photographer’s visit, wearing brass shoulder-scales and white gloves, which would normally never be used during drills or in exercises involving live ammunition. Their regimental camp lies out of sight, beyond the earthen rampart at far left. Whoever was the original photographer that recorded this scene, this image was copyrighted or “Entered according to Act of Congress in the Year 1861 by M. B. Brady, in the Clerk’s Office of the District Court of the District of Columbia” so as to be featured in his special series of oversize albumen-silver prints entitled Brady’s Incidents of the War, which were sold as high-priced collectibles for an upscale clientele. Shop for more laptop accessories at zazzle. The regiment’s designation was officially changed from the 4th Infantry into the 1st Connecticut Heavy Artillery as of January 2, 1862, and publicly announced one week later, which explains why any cap-badges which can be discerned in this photograph still featured the hunting-horn or bugle emblem of the infantry, rather than the crossed guns of the artillery which would not be issued until some time shortly thereafter. The regiment remained on garrison-duty at Fort Richardson for another three months, until ordered into the Virginia Peninsula on April 2, 1862, to constitute part of the siege-train of the Army of the Potomac and participate in the spring offensive against Yorktown. As for Fort Richardson, the contours of its overgrown ramparts can be glimpsed today beside the ninth-hole green of the Army Navy Country Club in Arlington, Virginia, still affording a fine commanding view over the Potomac River and downtown Washington, D. C.
On April 8, 1862, the recently-raised 4th New York Heavy Artillery Regiment of Col. Thomas D. Doubleday — Abner Doubleday’s older brother — marched from Fort Carroll through the streets of Washington, D.C., and by 1:00 p.m. had arrived to relieve the 97th New York at Fort Corcoran. This latter unit had been merely serving as that outpost’s interim garrison, and only for the past nineteen days (since March 20, 1862), while the 88th Pennsylvania had also been responsible for several other subsidiary forts nearby, all of which were scattered atop the Arlington Heights on the Virginian side of the Potomac River. A heavy storm of sleet, hail, and snow broke just as the 4th New York was arriving at its new base, followed by several days of cold and steady rain, yet their detachments were soon distributed around among their various other encharged forts as well. Specifically, Companies C, D, and H of the 4th New York Heavies would initially remain in Fort Corcoran to man the guns at their new regimental headquarters, while Companies A and E occupied nearby Fort Woodbury; Company B went into Fort DeKalb; Company F went to Fort Bennett; and a small detail from Company H was sent to Fort Haggerty. All of these units would spend the next few months in intensive artillery-drills. Seven-man gun-crew of the 4th New York Heavy Artillery, posing with a barbette-mounted 24-pounder in Fort Corcoran, spring of 1862. It is believed that one such seven-man gun-crew and two officers were photographed during this training interlude in the spring of 1862, posing beside their barbette-mounted M.1845 24-pounder gun within Fort Corcoran, as can be seen in the accompanying picture at left. The officer seated casually on the edge of its earthen platform in the foreground, might very well be Capt. Thomas D. Sears of Company A, the numeral “4” being faintly legible on the crossed guns of his cap-badge. Samples of a grapeshot, round-shot, and canister-shell — the three types of ordnance which this weapon typically fired — are all displayed on the ground between him and a Second Lieutenant, who is leaning upon his sword. 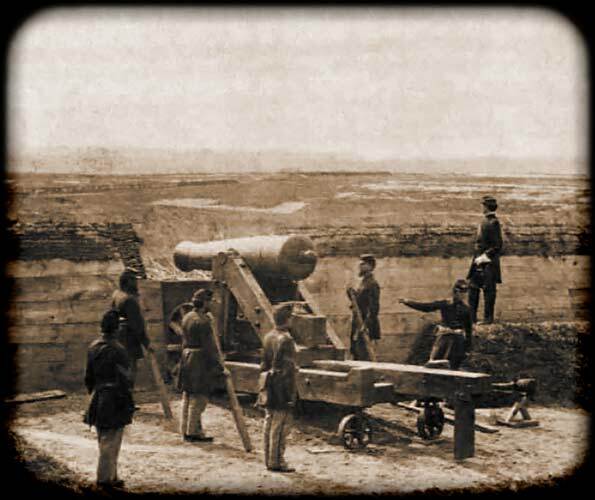 A First Sergeant is serving as the gun’s chief-of-piece, standing atop the barbette-tongue with his hand “stopping the vent” of the 24-pounder’s lockpiece, while two cannoneers at its muzzle are poised in the act of pretending to sponge out its bore. Directly beneath this elevated pair of cannoneers, another artilleryman is holding the wooden container (clearly labeled as a “pass box”) which was used to bring live cartridges filled with gunpowder from the magazine, while the cannoneer at far right has a pouch slung around his waist — doubtless containing the 12-foot lanyard which he would then have to hook up and uncoil to actually fire the gun, upon being given the appropriate shouted command. ... stationed at a brass field-piece, with one old soldier in charge. We loaded the cannon with a percussion shell, put in the primer, hooked on the lanyard, and waited nearly a week for the enemy. None appeared, of course, but the 4th remained in this new locale for the next two years, without returning into Fort Corcoran. One battalion was subsequently detached to help quell the Draft Riots in New York City during the summer of 1863, and the entire 2,500-man regiment was eventually extracted from the Washington defenses in late March 1864, to be redistributed amongst Gen. Ulysses S. Grant’s Army of the Potomac so as to participate in his forthcoming offensive into Virginia. For that particular campaign, a large-scale penetration into enemy territory, two of the 4th New York battalions were assigned to light field-guns in his Artillery Brigade, while the First Battalion of the 4th — now under Thomas Sears, since promoted to Major — entered the Battle of the Wilderness as infantrymen, only to be initially mauled and dispersed by Gen. Robert E. Lee’s surprise attack, before regrouping. With the conflict dragging on, President Lincoln issued a call on July 1, 1862, for an additional 300,000 volunteers to serve for three years in combating the Confederacy. 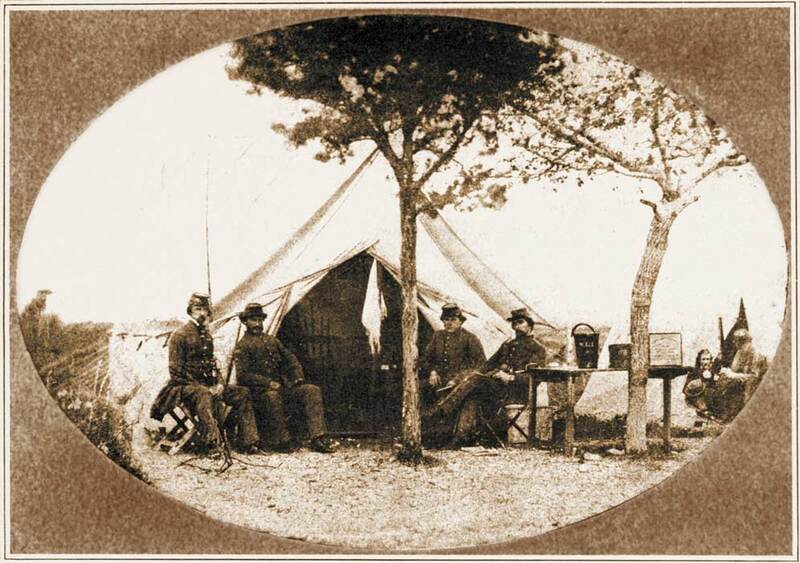 The State of Vermont responded by promptly raising two more regiments, whose companies of raw recruits were assembling at Camp Bradley outside of Brattleboro by August 15, 1862. Ten of these companies were then organized and mustered into service as the 11th Vermont Volunteer Infantry Regiment on September 1, 1862, and six days later departed there for Washington, D.C., arriving on September 9th to be assigned to duty in the chain of forts constituting the northern defenses of the capital. Initially, only Companies E and K were assigned to garrison Fort Totten on September 27, 1862, Company A having been sent to hold Fort Lincoln; Company B being divided between Forts Massachusetts and Stevens; Companies C and D going into Fort Saratoga; Company F to Fort Bunker Hill; Company G to Fort Lincoln; Company H to Fort Slocum; and Company I to Fort Thayer. On November 17, 1862, some of these companies were redistributed, at which time Company A replaced E at Totten, and along with K remained under Maj. George E. Chamberlin as the fort’s permanent garrison for the next sixteen months. The regimental status was officially changed from infantry into the 1st Vermont Heavy Artillery as of December 10, 1862. Most of the noncoms and privates are shown still wearing their dress “shoulder scales,” a useless metal adornment which would become less commonplace amongst regiments once truly active campaigning began. List of Arms & Ammunition on Hand at Fort Totten, September 11th, 1862. 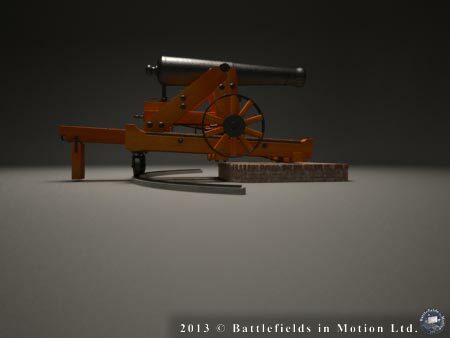 Ammuntion: 32 POUNDER: 642 Shot, 165 Grape, 100 Strap, 291 Spherical Case, 1175 Cartridge. 24 POUNDER: 180 Shot, 45 Grape, 30 Strap, 40 Case, 567 Cartridge. 8 INCH SIEGE HOWITZER: 60 Cannister, 90 Shell, 124 Cartridge. 10 POUND PARROTT: 100 Fuse Shells, 44 Cannister Shot, 100 Cartridge. 30 POUND PARROTT: 110 Shells, 75 Solid Shot, 150 Cartridge. 170 HAND GRENADES; 500 Pounds RIFLE POWDER; 100 Pounds CANNON; 100 FUSE, Assorted; RIFLE BALL CARTRIDGES: 14,000, including Those in Cartridge Boxes. This photograph, facing south, is believed to show the interior of Fort Totten when manned by the 3rd Massachusetts Heavy Artillery in 1864. Earl Hess has noted in his caption on page 39, the heavy timbers revetting the buried magazine at right, plus the postern-tunnel entrance in the immediate foreground, which exited out into the ditch on the gorge or rear side of the fort. By the order of Burnside, a large enclosed bastioned field work, capable of holding 1,000 men and mounting thirty guns, is being constructed near our camp. It commands the town, also the Neuse River. It is being built principally by contraband laborers, who are paid and rationed by the government. 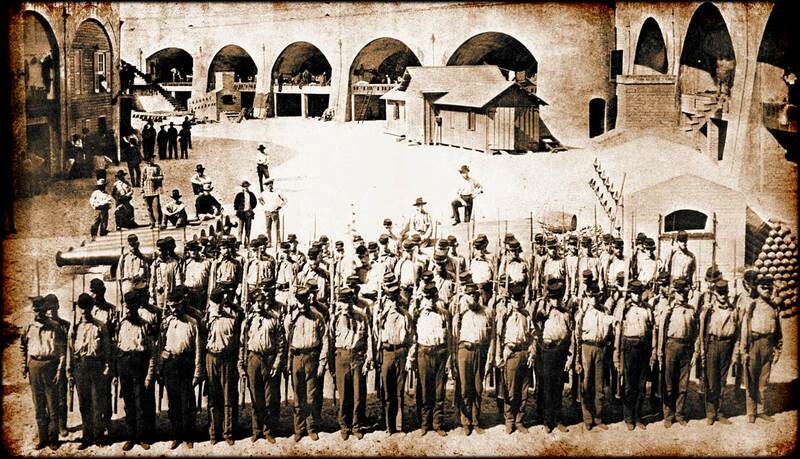 Yet another among the volunteer Union regiments which continued to arrive to help man the defenses of Washington, D.C., was the 34th Massachusetts Infantry Regiment, whose ten companies had begun mustering “at the Agricultural Fair Grounds near the City of Worcester” in late June 1862. Its 1,027 officers and men were then marched off to the railroad station by August 15, 1862, passing through Baltimore early on the morning of August 17th, before reaching the national capital that same evening. After pausing outside of Willard’s Hotel next morning to hear a few inspirational words from Col. Michael Corcoran of the 69th New York — recently released from Confederate captivity — the 34th Massachusetts marched across the Potomac River into Virginia and were encamped by August 19, 1862 near Hunter’s Chapel, between Arlington and Munson’s Hill. 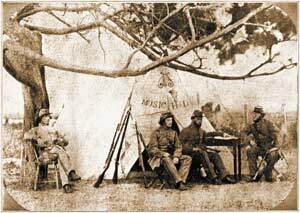 After various marches and counter-marches over the next few weeks occasioned by distant Confederate threats, the green 34th was at last assigned on September 16, 1862, to encamp permanently in the vicinity of Fort Lyon. This was a major 31-gun stronghold perched atop Ballenger’s Hill, south of Little Hunting Creek and Cameron Run near to the Mount Eagle plantation (its modern site constituting part of the Washington Metro’s Huntington Station today), destined to soon become district headquarters for Maj.-Gen. Samuel P. Heintzelman. 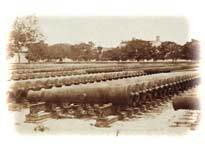 As that autumn set in, some of the 34th companies were ordered on November 16, 1862, to begin receiving special training as gunners, so as to become transformed into the regiment’s “Artillery Battalion” and man heavy pieces which were to be installed into new defensive outworks. 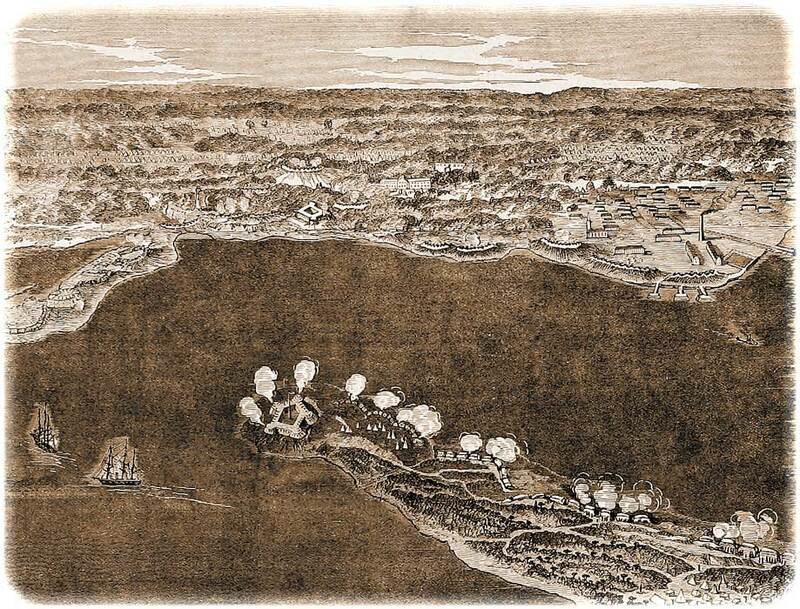 The remaining companies of the 34th Massachusetts were meanwhile assigned to toil away at digging and erecting some new field-fortifications south of Fort Lyon, which — being situated atop one of the highest points of land south of the occupied City of Alexandria, with a commanding view over Telegraph Road, the Columbia Turnpike, the Orange and Alexandria Railroad, and Little River Turnpike — was a crucial strategic strongpoint that had to be held at all costs. 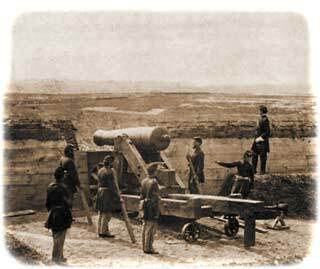 The men of the 34th therefore worked through rain and snow to install the first five guns into a position due south of Fort Lyon dubbed “Redoubt A” by December 16, 1862, with platforms for another six guns being “nearly completed” at that same time. In all, five companies of the 34th were intended to occupy this new defensive work by next spring, two from the Artillery Battalion to operate its eleven heavy guns, while the other three infantry companies were to remain encamped behind in support. Two more earthen fieldworks were also being created nearby as well: smaller “Redoubt B” southeast of Fort Lyon, to be manned by another two companies of the 34th — one of artillery and one of infantry — plus three more companies to defend a future 16-gun “Redoubt C”, still farther southeast. (“Redoubt D” would be added later by another regiment.) The labors of the Massachusetts volunteers continued throughout that winter of 1862-1863, especially whenever mild spells in the weather thawed the ground sufficiently for proper excavation, and all three defenses gradually took shape atop their disperse high-points. The first practice-rounds were fired off with live-ammunition on April 12, 1863, as the new spring campaigning-season began with the return of better weather. On April 30, 1863, two companies apiece of the 34th Massachusetts were assigned to garrison Redoubts A, B, and C, the remaining four companies being ordered to encamp in the rear of this defensive-line to provide infantry support and act as a reserve. The men were justly proud of the elaborate new earthworks which they had erected, some crews even competing to scour the nearby countryside “in search of sound turf with which to sod their magazines, bomb-proofs, and parapets.” It was perhaps upon this occasion — when the 34th gunners first stood to their guns within their newly-completed emplacements — that a photographer was hired to record this momentous accomplishment. The officer in both pictures, Capt. Charles L. Chandler, commanded Companies A and F at Redoubt C.
Make unique logo buttons on zazzle. 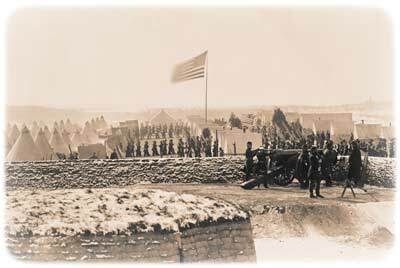 Ironically, orders arrived very shortly thereafter for the 34th Massachusetts to be rotated out of its carefully-constructed redoubts, being relieved one week later by various companies of the 19th Connecticut Volunteer Infantry. 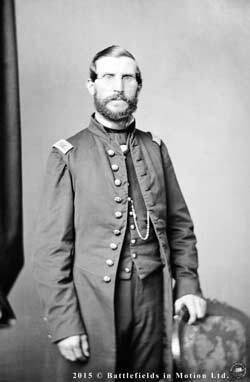 And two months afterward, Redoubt C would be renamed “Fort O’Rorke” in honor of the First Lt. of Engineers and Col. of Volunteers Patrick H. O’Rorke (sometimes spelled O’Rourke or O’Rourk), who had been killed at the Battle of Gettysburg on July 2, 1863. Redoubt A would likewise be renamed “Fort Weed” after Capt. Stephen H. Weed of the 5th U.S. Artillery and Brigadier General of Volunteers, and Redoubt B would become “Fort Farnsworth” in honor of Brig. Gen. Elon J. Farnsworth. Design unique customized mouse pads online at Zazzle. 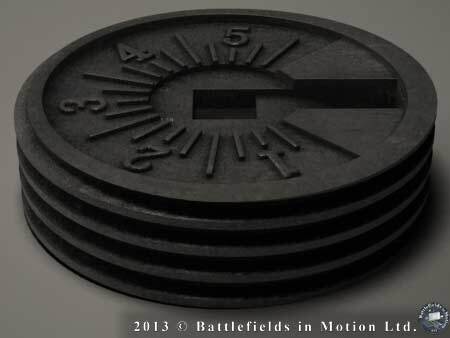 2011 - 2013 © Battlefields in Motion Ltd.